Emma Sulkowicz carried her mattress everywhere across campus during her senior year at Columbia University, as a public demonstration and critique of how the school had handled her sexual assault claim. Emma’s project, Carry That Weight, shocked but also inspired young women to look at art as a form of healing. Even though many told Emma her performance of Carry That Weight wasn’t good enough, she started the much needed conversation of sexual violence on college campuses. Because of her performances, strangers would randomly reach out to her in public with their own personal trauma and speak to her without any discretion. During one of her performances, Self Portrait, people would come in and speak to her in the gallery, which felt like a confessional group to Emma. This is how the idea for The Healing Touch Integral Wellness Center was born. During this performance Emma plays a practitioner in a para-fictional medical clinic providing a revolutionary cure for human desire with her patented Healing Method. From January 13 – 29, anyone can reserve an appointment with Emma at Philadelphia Contemporary, where they’re allowed to ask her about any concerns they have and speak to her as if she was their doctor. From then on, the experience of Emma’s performance will change the patient’s view of art and how it could help them. 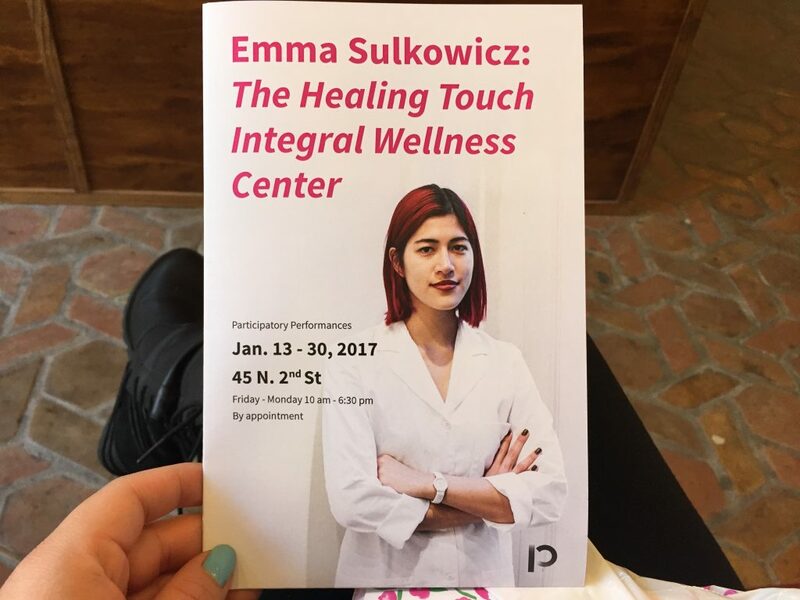 To fully experience Emma’s art performance, I booked an appointment with “Dr.” Emma Sulkowicz. I was skeptical at first—would this just be a quick appointment of myself starting at art and realizing it’s just beautiful? I was required to fill out a patient’s sheet 15 minutes prior to my appointment, where I mentioned that I might not open up to Emma during my appointment. It might have been my stubbornness speaking, but I didn’t think art could be a way to heal the things that were bothering me the most. However, to my dismay, I was wrong about the 30 minute session I had with Emma. My hesitation was the first thing she pointed out when she welcomed me to her office. From then on, I knew I could be brutally honest with her. I explained every detail of what I wrote down and why I did so. I felt like I could speak to Emma as a friend and the advice she gave me in those few minutes were somewhat relieving to hear from a complete stranger. I spoke to her about the frustration I felt about my assault to the stories of why I didn’t want to be the perfect person my family and friends wanted me to be. My appointment made me realize I was my biggest critic and that’s why I strived to be imperfect and my need to feel small by admiring things like NYC or Philadelphia skylines because my problems were small compared to the large buildings around me. In an unusual way, I also came to the conclusion of my use of art as a way to get away from real life when I would visit art museums or art exhibits by myself because there was a beauty to it and it was also imperfect in its own way. My talk with Dr. Sulkowicz made me realize that I loved imperfect things and I needed them as a way to escape my struggles I’m facing. Emma’s performance will be held at Philadelphia Contemporary until Sun, Jan 29, 2017. Find out more on here.